We have been working through all the potions and lotions that we apply to our bodies as a family, bigs and smalls, to get rid of all the ones containing evil toxic nasties. Saw the latest post on HANDSOME THINGS which featured AFRICAN BLISS , 100% natural handmade soap, which then led me to FAITHFUL TO NATURE, a wonderful online organic shop. Received my first parcel on Monday morning and was delighted with the contents. 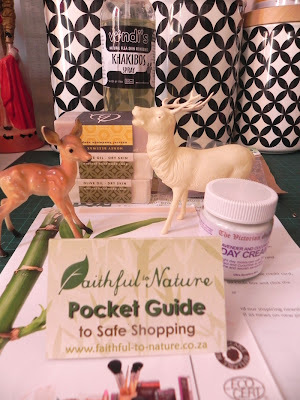 Besides what I had ordered there were great little surprises of testers and a pocket guide to safe shopping. p.s the bambi and stag are my latest EBAY purchases that muscled in on the action. Smelling tasty and feeling healthy!